The top floor of the college’s W block at its Haybridge campus is taking technology-led learning to a new dimension with an array of cutting-edge equipment – one of the largest of its kind in the country. More than £500,000 of funding from the Marches Local Enterprise Partnership has helped to create the new suite, which will help train students and workers in the innovative digital and technical skills vital to the region’s economy. Graham Guest, principal and chief executive of the college, appeared in appropriately hi-tech holographic form on the suite’s state-of-the-art monitors to deliver his welcome speech to a group of invited guests. He said: “The virtual and augmented reality suite provides a rich combination of state-of-the-art hardware and software, from the world’s leading technology manufacturers and developers. “It will not only take our teaching and learning into the future, but also ensure our students are developing the vital skills needed to have a successful career. 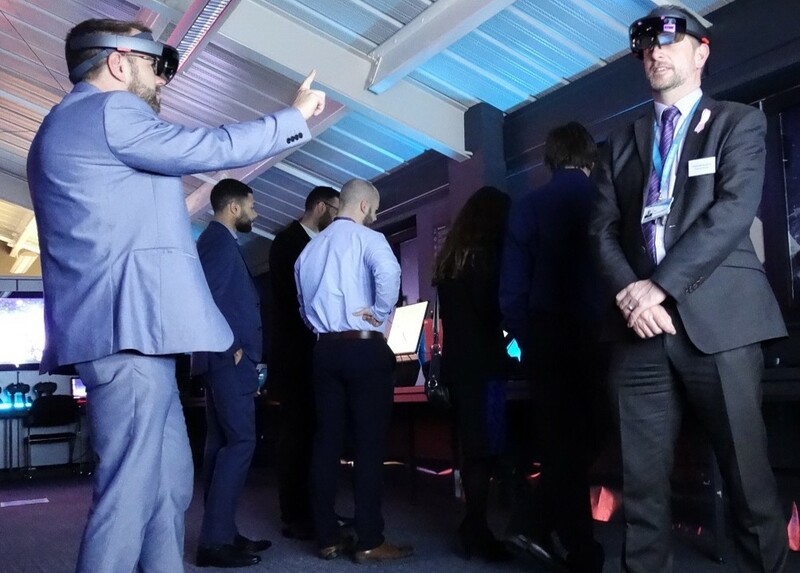 “Our suite is a well thought-out teaching environment which includes a virtual reality cave, which can transport users into other working and learning environments. “This is accompanied by a full size, hydroscopic 3D presentation screen, immersive virtual reality training booths, interactive mirrors, and motion simulators. “Not only will the suite benefit our students, the area will also support local employers that begin to use this technology for training, and also project future environments for their workforce. The college is working closely with experts from EON Reality, which is powering the suite with its trailblazing AVR Platform. Mark Bridgeman, global chief operating officer and UK managing director at EON Reality, said: “The UK finds itself sprinting to keep up in offering the teaching, training and courses that are competitive in a vastly accelerating global marketplace. “This includes training future talent in using and understanding XR technology – ultimately, preparing students for their what their employers expect of them. EON Reality’s AVR Platform is designed specifically for learning and development, and training. VR is used to simulate real-life environments to accelerate learning experiences, especially ones which are usually inaccessible. It means that Telford College essentially has a live oil and gas compressor plant for engineers to train on – in virtual reality form. Augmented reality adds digital information to the real-world environment. So, existing 3D content can be analysed and studied in a live classroom space, whether that's a giant jet engine or a 'dissection' of a human organ. Prospective students will have chance to visit the new VR and AR suite when Telford College holds its next open event on January 23. For more details, see www.defineyourfuture.co.uk.